Ocularis Mix & Match allows you to use different camera license types in the same system without additional fees. So you’ll not only save with Ocularis’ self-guided interface which allows you to cut operator training time in half, you also save thousands of dollars in installation costs by customizing your system to meet your exact requirements. Ocularis comes with a Camera Finder discovery tool that quickly finds cameras on your network to easily add them to your system. The ability to use manufacturer-specific universal drivers allows you to get cameras up and running in no time without waiting for model-specific drivers. And now, cameras and their MAC addresses no longer need to be registered, which makes licensing and changing cameras easier than ever. Ocularis is hardware agnostic, supporting a continuously updated roster of IP cameras and encoders. Ocularis supports centralized or distributed deployment, camera on-board recording, user rights management, automatic configuration backup, camera tampering alerts, multicast, audio recording, bookmarking, audit logging, 256-bit encrypted video export, and more. Ocularis supports a very high number of cameras per server and it automatically balances the load between hard drives while at the same time allowing you to prioritize cameras if you are nearing hard drive space limitations. The recording process uses hard drives more efficiently and can eliminate the need for high-performance (SAS) drives in most applications. Take advantage of seamless integrations with over 300 technology partners in video analytics, access control, license plate recognition, point of sale, and more. Ocularis fuses meaningful events and lets you monitor multiple security applications under one user-friendly and powerful interface. Say hello to the most user-friendly open architecture VMS. Whether you’re new to surveillance or simply ready to upgrade from analog to IP, Ocularis is a smart and simple choice with easy installation, scalability, high-speed performance, and intuitive controls. Ocularis Professional enables third-party integrations that will make you an even better investigator and help you move closer to prevention. Whether you are in charge of stadium security or the safety of an entire municipality, response time means everything. 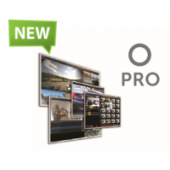 Ocularis Enterprise improves site-to-site capabilities and communications with powerful features like push video feeds to remote displays and advanced centralized management. With an unlimited number of cameras per server, your security just got stronger and smarter. Perfect for the wide scope and high intensity of airport hubs, seaports, and large cities, Ocularis Ultimate offers you the highest level of centralized intelligent command and control. Ocularis Ultimate comes with advanced failover and redundancy features for optimal data protection. And its edge recording technology keeps your cameras recording and storing data even when connection to the server is unavailable; then it seamlessly reconnects the video when connection is resumed. Nothing is too big for Ocularis Ultimate when it comes to being safer.